Flywheel Review 2019: Is Flywheel a Good Hosting? In almost every category, Flywheel’s performance exceeded expectations. From its intuitively-designed processes to the great page loading speeds, Flywheel’s pricing plans present fantastic value for money. Flywheel’s fun platform eliminates the greatest pain points of WordPress hosting, so you can focus on building your website instead of fixing performance and security issues. Flywheel was started in 2012 by three web developer friends, Dusty, Tony, and Rick. Having worked in the industry, they knew how difficult it was to be the middleman between a client and a hosting service. Flywheel was designed to provide freelancers, agencies, and resellers with a platform that makes it easy to use a workflow-centric approach, include clients in the process, and collaborate on a project. However, targeting this specific customer base comes with a lot of responsibility. If you’re a professional in this space, you need tools that help you work smarter and faster — not harder. For teams or agencies, these tools become even more important. Can a seemingly playful option like Flywheel also provide the very serious features you need to succeed? An even better question is: can Flywheel remain as intuitive and “delightful” as it claims while providing all this firepower? Flywheel is also one of the pricier WordPress hosting options out there, which means you expect a certain level of quality with the premium you’re paying. The company has ten global data centers located in the U.S., Canada, U.K., the Netherlands, Germany, Singapore, and Japan. Note: Flywheel offers a downloadable version of its software that you can use to host locally from your own computer. However, for this review, I’ll be looking at the regular hosting service. Flywheel provides a range of features and workflow tools that will help you and your team work together and work smarter, not harder. A Flywheel plan comes with almost everything you need to host your website successfully. They all come with a free SSL certificate (via Let’s Encrypt), daily backups, free pre-installed WordPress, and a pre-installed caching engine. Flywheel also offers free WordPress migration services from a number of other hosts or from archive files. This is a huge plus, considering that many other hosts make you do this manually or pay an extra fee. You can also add paid CDN services (for better page load times) or SSL certificates from other providers, as well as a WordPress multi-site installation. Blueprints is a great feature if you have a standard design, theme, or set of plugins you use with most of your websites. You can create a “Blueprint” of one of your WordPress websites that saves all these settings. Then, as you’re building a new WordPress website, the Blueprint will allow you to quickly apply your pre-configured settings. You can do this easily from your Flywheel dashboard with no additional setup required. Developers or avid WordPress users will love this feature. It allows you to effectively make a copy of your live website, make changes to it, and only apply the new settings to your live website when you’re happy with it. This will minimize downtime as well as help ensure you don’t break your existing site. Flywheel makes it very easy to add collaborators to your websites. This is particularly interesting for freelancers or agencies, as it can also be used to add clients to projects, making them part of the process. You only need to provide the collaborators’ email addresses, and they will be given their own logins. Flywheel also offers you the ability to set up an “Organization” dashboard. This is like a team portal, where you and your team can manage multiple websites. The activity feed allows you to easily stay up to date with everyone’s progress. Cloning is a new-ish feature by Flywheel that allows you to make an exact copy of a website. This may sound similar to Blueprints, but it’s different in that you literally clone the entire website. Then, you can either add the clone to a bulk site plan or use it as the template for a new one. With Blueprints, you only save the settings to reuse later. This is very useful if you want to base another website completely on an existing one and make tweaks later. Flywheel will make nightly backups of your website and keep these safe for 30 days. You can also make backups yourself and restore them at any time. You have the ability to choose between a full restoration or individually restoring the databases or files. The interface is extremely easy to use with the trademark Flywheel dashboard style. Delivering on its promise to do things a little differently, Flywheel has leveraged the Google Cloud Platform to create a cloud infrastructure for its users. With technologies such as auto-healing websites, instant scaling, FlyCache, and a free global CDN, Flywheel promises to provide better performance and higher levels of server availability. Flywheel’s playful and accessible interface makes it simple to handle even its most complex features. Flywheel obviously doesn’t want to stand in the way between you and WordPress. It’s so easy to navigate and use, allowing you to focus on building your WordPress website. By providing a user-centric interface and keeping the design consistent across the entire platform, Flywheel accommodates even the newest users. Flywheel provides a free website migration service that you can request during the signup process. The migration takes one to three business days, but you can speed it up for an extra charge. The team will essentially create a Flywheel version of your website for you. Because they can create this copy while you’re still hosting the original, you don’t have to take your website down in order to migrate it. Your WordPress installation will be ready for you immediately after you’ve registered, so you can start editing the template and adding content right away. Flywheel’s dashboard itself deserves mention. At every step in the process, the way forward is always clear and intuitive. The design is modern and straightforward with the most essential functions highlighted. It might not have all the features of cPanel, but it also isn’t as bloated or dated-looking. Instead of going for some standard control panel with database access (or phpMyAdmin) like most hosts, Flywheel has stuck to its superb user interface. This makes accessing your database completely user-friendly and unthreatening. Flywheel claims that you can sign up and have your website ready in 60 seconds. However, this is only really the case if you opt for a demo site, don’t count the actual duration of installing WordPress, and know precisely what you want ahead of time. Because the platform offers a few unique features for web developers, it’s not the simplest process. If unlike me, you don’t know exactly what you want, these additional elements might be distracting. However, Flywheel does provide a good amount of guidance and information so that you know what’s going on and what you should do next. To see it all in action, check out my in-depth post on how to create a Flywheel account. Starting out with Flywheel was quick and painless. The interface does a great job of guiding you through the process and limiting upsells or other distractions. It took me only about 30 minutes to connect my domain, access WordPress, and install the CDN. The interface highlights the most important and frequently used features. Even if you’re not sure what to do, the UI is intuitively designed and has help links right where you’ll be looking for them. You can see exactly how intuitive the process was when I did it myself. Though it doesn’t offer any uptime guarantees, Flywheel still delivers on performance with rock-solid stability and blazing fast loading speeds. Flywheel doesn’t provide its own data or guarantees on uptime. However, it seems to consistently score 99.97% to 100% when independent reviewers test its uptime using tools like Load Impact. I’ve also seen Flywheel keep loading times consistently low even under stress tests. One reason is that it’s focused on WordPress hosting and uses software like Varnish caching to optimize its platform. First of all, I haven’t experienced any performance issues from my side using my WordPress hosting. I also tested the performance myself as visitors would experience it. I chose server locations in the U.S., so obviously my performance would be the best there. I also set up a CDN for my website. Using Sucuri, my website scored an A+ in page load times. A typical U.S. visitor would see my website load in about 0.085 seconds (or, 85 milliseconds). The average loading time for other locations internationally was around 240 milliseconds. The only outlier was India, which took over a second to load. Two seconds is generally accepted as the limit before you start losing visitors, so overall, performance was pretty good. Flywheel’s support staff always go out of their way to make you feel welcome, but you might have to wait during peak times. Because live chat access was so conveniently located on my dashboard, I preferred this option whenever I had to contact customer support. At times, I was instantly connected with Flywheel’s support staff, while at other times I had to wait about 15 minutes. I’m not sure what made the waiting times so different, but it might be related to U.S./Europe office hours. In the first instance, I wanted to know how to set up my DNS correctly, as domains have to be purchased separately from a registrar — Flywheel doesn’t offer domain registration services. The support representative replied immediately, giving a short explanation and supplying me with links to the step-by-step guides. He even recommended a few registrars. He also informed me that since GoDaddy had recently updated its interface, the steps might not be 100% accurate, and was willing to wait while I finished the process in case I needed help. In the second instance, I had an issue with my DNS: I’d previously added an external domain I own to my Flywheel account. However, when I changed it back to my default, free Flywheel domain, I could no longer navigate to my WordPress website. After asking for my domain name, the agent asked me to wait while he fixed it for me. It took about 15 minutes, but my domain was up and running once again. Technically, Flywheel combines ticket and email support: you submit a ticket via the Flywheel website but get a response via email and can continue the conversation there. My last email interaction was at a busy time, when both U.S. and European customers would have been active. However, I still got a reply in under 30 minutes after I submitted the ticket. I’d asked where I could locate my billing statements in my dashboard. I also had a few more questions regarding when and how my add-on CDN would be billed. The support representative answered all three questions and included a screenshot of where to find my billing statements. As always, they were very courteous and friendly as well. Because it’s so conveniently located in my dashboard, I made a bunch of interactions via live chat since it is so accessible when you encounter a problem. The shortest wait time I’ve had was instant, and the longest was about 15 minutes. I’m not sure what contributes to this large discrepancy in waiting times but it might be related to U.S./Europe office hours.In the first case, I wanted to know how to set up my DNS correctly as you need to purchase a domain from a registrar. The support representative replied immediately giving a short explanation and supplied me with links to the documentation on the steps. He even recommended some registrars. Also, he informed me since GoDaddy recently updated their interface that the steps might not be 100% accurate, and was willing to wait while I finish the process in case I need help.In the second case, I had an issue with my DNS where I switched to my GoDaddy domain but when I switched back to my Flywheel domain I couldn’t access my site. After asking for my domain, the agent asked me to wait while they fix it for me. It took about 15 minutes, but my domain was up and running once again. Technically, Flywheel has ticket and email support rolled into one as you submit a ticket via the Flywheel website but get a response via email and can continue the conversation there. My last email interaction must have been at a busy time as both the U.S. and Europe customers would have been active.However, I still got a reply under 30 minutes from the moment I submitted the ticket. It was regarding where I can find my total account billing (I was looking at the same place on my dashboard as for a website specific dashboard). 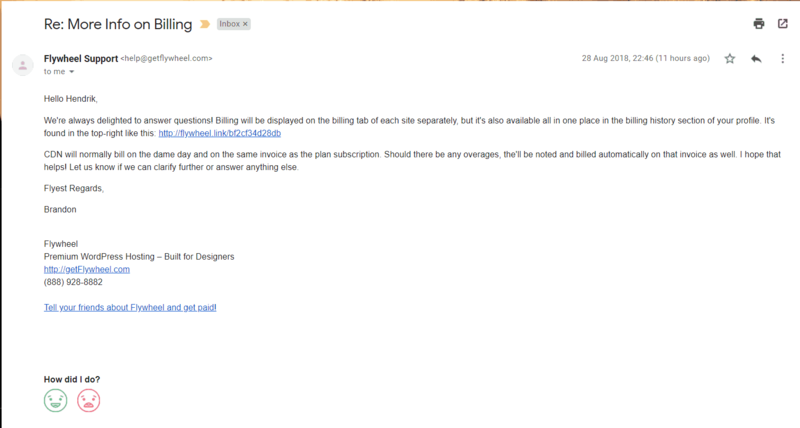 I also had some more questions regarding when and how my add-on CDN will be billed. The support representative answered all three questions and included a screenshot of where to find my billing. As always, they were very courteous and friendly as well. Flywheel can’t really be considered “low-cost” hosting, but it offers enough features to make it worth your money. Flywheel offers three broad categories of WordPress hosting: single-site WordPress hosting, multi-site WordPress hosting, and enterprise WordPress hosting. You can also contact them to set up a custom multi-site solution or an Enterprise solution. You can opt for monthly or annual billing with any plan, but the latter will be discounted. There are no free plans, but you can create a free demo site if you plan to transfer billing to your client within 14 days. Flywheel only offers two payment methods: credit cards (Visa or MasterCard) and PayPal. Flywheel is not a low-cost hosting service. However, it’s not so expensive that it’ll be a drain on professional web designers or agencies. Still, there are much cheaper options if you’re willing to give up the collaborative tools and custom interfaces or you just want to host a personal site. 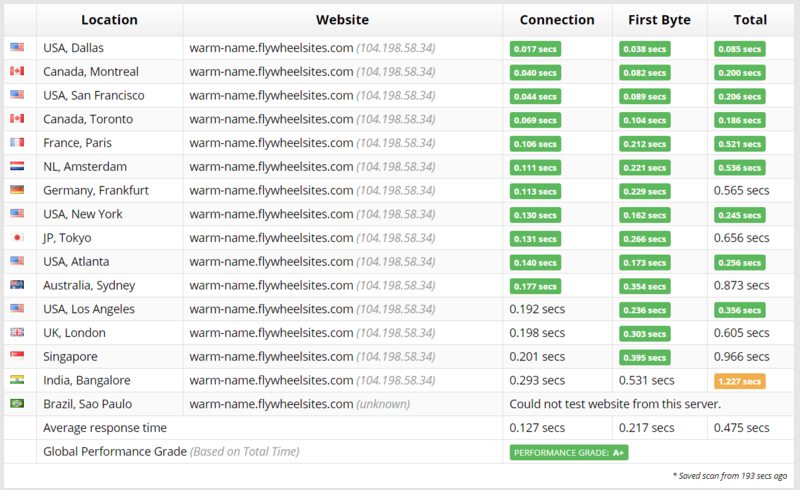 One great thing about Flywheel is that it won’t shut down your website if you exceed your bandwidth limits. It also doesn’t automatically charge you for overages. Instead, they’ll contact you if your website frequently goes over the resource limits and give you the option to upgrade your plan. However, they will charge you extra for using your own SSL certificate, and their CDN service has restricted bandwidth with overage charges. That being said, they do provide a free SSL certificate and a pretty affordable CDN to begin with. Ironically, Flywheel makes it even easier to cancel your subscription than to sign up. To their credit, they never want to make you feel “locked in,” so they’ve got a refund policy of three days (72 hours) for monthly billing and 30 days for annual billing from the last moment you were billed. If you chose monthly billing, your subscription will remain active for the remainder of the month, and with annual billing, it will stay active for the remainder of the year. The 72-hour limit for monthly plans is a bit short, and one of the only clear cons I could find regarding Flywheel’s refunds. It’s hard not to cringe at the prospect of talking to staff when canceling a subscription. You just can’t help but feel a little guilty. However, Flywheel also follows a “zero questions asked” policy, so you don’t have to give any reasons for cancelling if you don’t want to. The whole process (including the support email) took me less than five minutes. You can see what I mean in my step-by-step guide on canceling and getting a refund. Flywheel proves that you don’t need a serious interface to cater to serious professionals, while packing handy features into a fun and streamlined custom dashboard. Flywheel provides a number of fantastic features that will help web developers streamline their workflows. However, what impressed me most is the way they do business by always being accessible, professional, and transparent. Plus, it takes a big load off your shoulders when you can simply let your website grow without the fear of unexpected overage charges. The biggest issue I could find with Flywheel is that it doesn’t provide domain registration. However, it makes up for this by providing a free SSL certificate, installing WordPress for you, and making the rest of the experience extremely straightforward and accessible. I have to say that my overall experience using Flywheel was very positive. In almost every category, Flywheel’s performance exceeded expectations. From the intuitively-designed processes to the great page loading speeds, Flywheel’s pricing plans present fantastic value for money. Wondering how Flywheel stacks up against other Web Hosting companies? Enter any other Web Hosting company and we will give you a side-by-side comparison.